One of the unexpected benefits of working for an importer is that I’m able to explore coffee shops beyond my normal MTA-bound radius and get to know roasters who are not maybe not the flashiest social media magnates but are busy making great coffee for the people of their towns. 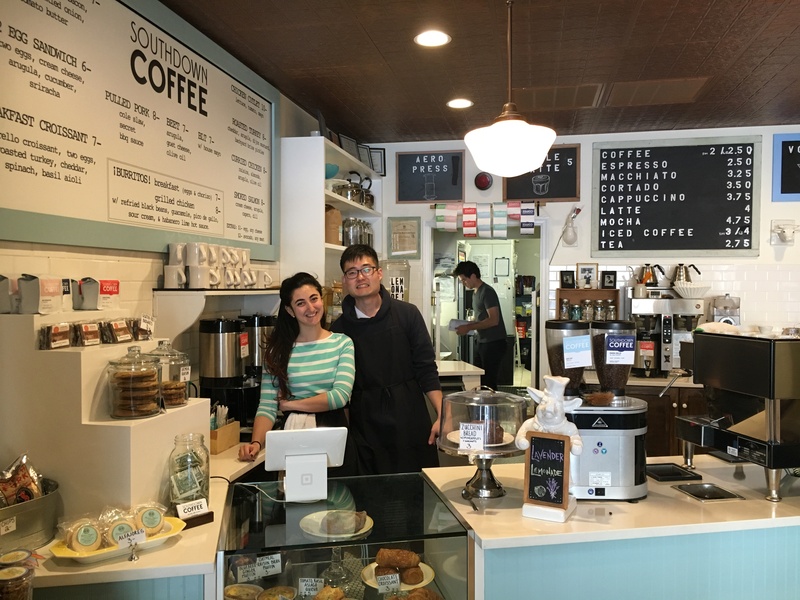 Southdown Coffee is a café and roastery in Huntington, Long Island. I visited a few weeks ago around midday. While Mark Boccard (founder, green buyer, and roaster) and I cupped through Southdown’s menu of Single Origin coffees, moms gossiped over coffees, grandmas came in to grab bags of whole beans, teens ordered iced lattes, and a businessman reading the paper lunched on the same delicious egg sandwich I was eating. The café provided something for everyone, and achieved exactly what you hope to in any retail space: make customers comfortable enough that the space is someplace they are eager to return to. Potted plants in the bay widow at the front of the shop and the smart color choices of furniture and walls created an organic personality that is somehow inherently different than the overwrought branding that sometimes infects city businesses from shoe stores to restaurants. Mark tells the story of Southdown and its place as a local family business. My dad and his family still own the building [where the café/roaster is] and neighboring buildings; that was the reason I ultimately felt like I could give it a go in Long Island. And it was just an untapped market. There’s nobody really doing anything of note in the town of Huntington with specialty coffee. [Local coffee] just needed a little update, I thought. We started with just the shop and were roasting all of our coffee at Pulley Collective [shared roasting space in Red Hook, Brooklyn]. Once it seemed like everyone was enjoying the shop and we’d be there for a long time, I was immediately working on getting a Dietrich IR12 so that we could roast everything under one roof. I think part of the concept of the shop was that on my mom’s side of the family there’s a many generational history of food service. My great-grandparents owned an Italian grocery market. My aunts owned a deli, so I thought of that as part of the concept for the shop. Rather than trying to move in with some sort of foreign food ideas, we created a food menu that is kind of like a deli homage with lots of classics—egg sandwiches, rice pudding. Just a ten percent deli atmosphere I thought would be a good way to anchor us. As our wholesale is branching out and we’re opening up a second shop [in Oyster Bay], we’re able to feature more single origin coffees at one time. Because it becomes a little difficult some times to sell certain single origins as retail only. We really need coffees that are brewable in the shop and servable on a daily basis. The most celebrated coffees from the consumer standpoint have been the Ernesto Fornao from Brazil and the Jurutungo from Panama. Mama Dalia from El Salvador was close second to Panama in popularity. Mark preparing to cup coffees in the shop. One of the more rewarding and unexpected things is watching people really start to notice the difference between the coffees and educating them on a very gradual basis to the point where you have all these people who are genuinely into coffee and you weren’t really coming out swinging. We let them figure it out. You come in to the shop and there are signs and colors, but if you just want to get caffeinated, you can get out of there and not learn anything. Sometimes people are just not in the mood. You saw when we were cupping today; people constantly want to know what we’re doing. It’s cool to think how many more people know about cupping or about how coffee is sourced, people who maybe before didn’t even think of coffee as an agricultural product. When the coffee is good and the vibe is relaxed learning is easy. Rice pudding doesn’t hurt either. It’s inspiring to see people in my generation working hard to build businesses that fits the place where it is.